The dress is one of the biggest and personal decisions the bride makes about her wedding. We always want to create a timeless portrait of this important wedding detail. This NYC bride chose a chateau destination wedding in the Loire Valley, France so displaying the gown in the historic chateau along with the French portraits in their gilded frames, the ornate tables, and the brocaded curtains shows a true sense of place. Since our first castle wedding at a Loire Valley Chateau in France back in 2007, French destination weddings have been a serious passion for us as wedding photographers. Some of the all-time favorite weddings we've shot have been at the following French Chateaux: the grand and imposing Chateau Chambord and Chateau Saint-Loup in the Loire Valley, and the more intimate rustic rustic country wedding location Chateau de Malliac in the Gascony countryside near Bordeaux. 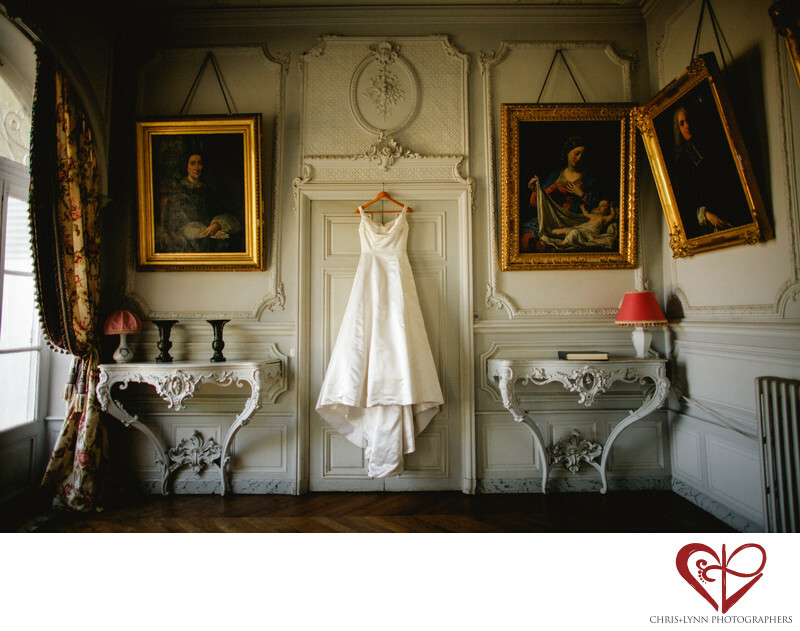 Some other dream French wedding photography locations in the Loire Valley include Chateau de Blois, Chateau de Cheverny, Chateau Chenonceau, Chateau de Villandry, Chateau Amboise, Chateau de Usse, Chateau Azay-le-Rideau, Chateau Chinon, Chaumont, Meung, Chateau Rivau, Clos Lucé, and Chateau Valençay. The best Bordeaux wedding photography locations include the UNESCO world heritage village of St Emilion,Hotel Chateau Grand Barrail, Chateau de Mirambeau, Les Pres d'Eugenie, Château Figeac, Château Haut-Brion, Château Lafite Rotschild, Château Latour , Château Margaux, Château Guiraud, and Château Lagrange. Location: Vallée de la Loire, France. 1/800; f/1.4; ISO 800; 24.0 mm.